The Tire Technology Expo and Conference 2017 took place from 14 – 16 February 2017 in Hannover, Germany. It is an event that has been growing consistently over the years, and is now the major tire-related annual fair in Europe. 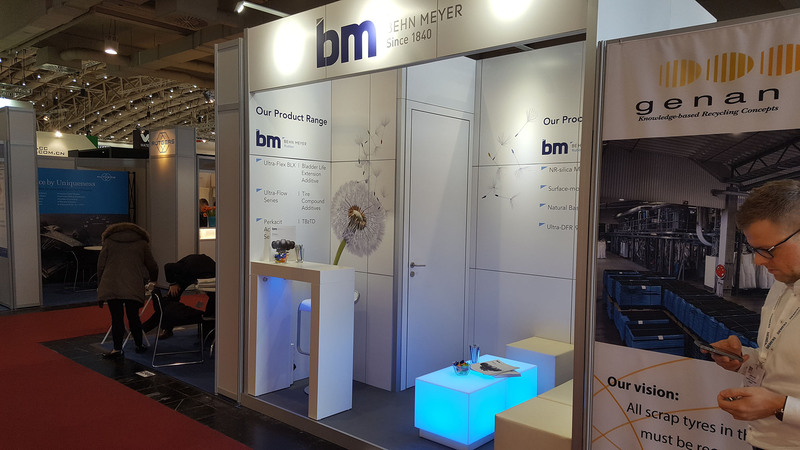 Behn Meyer Europe GmbH was represented for the first time this year at its own booth, where many of our regular customers were invited and received in an appropriate atmosphere. In addition, Behn Meyer Europe also hosted many new and interesting market participants from all over the world to present our expanded product portfolio for the tire and rubber industry. Dr. Joachim Bertrand gave a lecture about our Natural Rubber-Silica-Master batches at the Tire Technology Conference, which went on adjacent to the fair. This lecture received some very positive feedback from many of the interested tire compounders who later visited our booth to hear more. Indeed, the combination of a lecture at the conference and a spot for discussion at the fair proved to be very successful. Behn Meyer Europe GmbH is looking forward to meeting all our peers again at the DKG in Nuremberg, Germany in 2018. This event is the biggest internationally-attended rubber industry fair in Europe.